Manchester City's new club badge appears to have been leaked, two days before it was due to be officially unveiled. Supporters had been consulted about creating a fresh design, and the new crest was set to be revealed on Boxing Day. However, an image of what appears to be the new badge was found on the Intellectual Property Office's website. A club spokesman declined to comment on the design. The badge is inspired by the crest used by the club until 1997. Many fans had expressed a wish to return to the old design, a circular badge featuring the red rose of Lancashire and a ship symbol traditionally associated with Manchester. Over the years, the club has alternated between circular badges and designs similar to the current coat of arms-style crest. A spokesman for Manchester City declined to comment, but confirmed the new badge's unveiling would go ahead as planned. The IPO is the government body that handles patents, trademarks and other copyright administration. 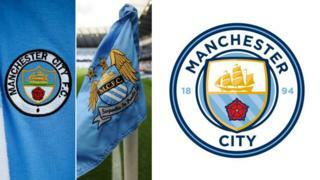 According to its website, Manchester City had the new badge trademarked on 22 December.